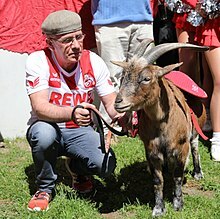 The club's nickname Die Geißböcke (The Billy Goats) refers to the club's mascot, a male goat named Hennes after the veteran FC player and (later) manager Hennes Weisweiler. The first Hennes was donated by a circus entrepreneur as a Cologne carnival joke. The current mascot is Hennes VIII, and has been since 24 July 2006. Another nickname for the club, more common locally due to its ambiguity, is FC (often written as Effzeh), a common German abbreviation for football clubs. Characteristic for the dialect spoken around Cologne, this is pronounced "EF-tsay",[Colognian IPA needed] in contrast to the Standard German pronunciation of the abbreviation where the second syllable is emphasized ([ʔɛf ˈtseː]). After the union of these two predecessor sides (1948), 1. FC Köln began play in the tough Oberliga West in the 1949–50 season and by 1954 had won their first divisional championship. That same year they lost the DFB-Pokal final 1–0 to VfB Stuttgart. Die Geißböcke won their second divisional championship in 1960 and appeared in the national final against Hamburger SV, where they went down to a 2–3 defeat. They went on to finish first in the Oberliga West in each of the next three seasons and again played their way to the national final in 1962 and 1963. They won the '62 match 4–0 over 1. FC Nürnberg resulting in entry to the 1962–63 European Cup where they were one of the favourites to win the trophy. In the first round Köln visited Dundee F.C. of Scotland and lost 1–8, and despite winning the second leg back in Germany by 4–0 they were out of the tournament. In the following year's national final they lost 1–3 to Borussia Dortmund. In 1963, FC Köln was selected as one of the original 16 teams to play in the Bundesliga, Germany's new professional football league. Köln continued their winning ways by becoming the first ever Bundesliga champion in the league's inaugural 1963–64 season. As German champions, Köln entered the 1964–65 European Cup where it met England's Liverpool at the quarter-final stage. After two 0–0 draws, a third game was played which was also a stalemate, this time 2–2. As the penalty shootout had not yet been introduced as the means of deciding a tie, Köln went out of the competition on the toss of a coin. Ironically enough, there was the need for a second coin toss because the first time the coin stuck vertically in the ground. The club also became the first Bundesliga side to field a Brazilian player when it signed Zézé for a then club record fee of DM 150,000. Domestically, Köln recorded a second-place finish in the 1964–65 Bundesliga season and won its first DFB-Pokal in 1967–68. At the start of the 1970s, Köln reached three DFB-Pokal finals in four seasons, losing all three; to Kickers Offenbach in 1970, Bayern Munich in 1971 and Borussia Mönchengladbach in 1973. The team also achieved another second place Bundesliga finish in 1973 before reaching another DFB-Pokal final in 1977, beating Hertha BSC over two legs to win the trophy for the second time. In recent years, the club's performance has been mixed. The FC holds the dubious distinction of the worst goal drought in Bundesliga history: in 2002, the supporters had to wait 1034 excruciating minutes (equivalent to 11-and-a-half games) until Thomas Cichon found the back of the net again. In the early years of the Bundesliga, 1. FC Köln was the most successful club in West Germany in terms of total points won. Beginning in the early 1990s, however, the club's performance fell, and in 1998 it was relegated for the first time. Since about 2000, the side has been a "yo-yo team", moving between the first and second divisions. It has returned to the Bundesliga at the end of the 2004–05 season as 2. Bundesliga champions after having been relegated the season before. There was little optimism about their return to the top flight as they were picked by German football magazine kicker as one of the clubs most likely to be relegated. This prediction came true when Köln lost to Hamburger SV 1–0 in the third-to-last match of the season. The club finished the season in second-last place and was relegated after conceding a league-worst 71 goals. The team's most prolific goal scorer was Lukas Podolski with a total of 12 goals, who transferred to Bayern Munich after the end of the season. He also appeared with the Germany national team at the 2006 FIFA World Cup. In late 2006, former coach Christoph Daum was convinced to once again take the helm of the 2. Bundesliga club and succeeded in leading the club back to the Bundesliga in 2008. After a successful Bundesliga campaign in 2008–09, Daum left Köln for his former club Fenerbahçe. Köln's former star-striker Lukas Podolski returned for the 2009–10 season. After a poor run of form in the 2010–11 season, recording only one win from its opening nine Bundesliga fixtures, Köln replaced coach Zvonimir Soldo with Frank Schaefer. Schaefer, who was originally in charge of the under-23 team of Köln, decided after the season that he would rather spend more time with his family than be a coach in the Bundesliga. Former Norwegian international and recent Copenhagen coach Ståle Solbakken replaced him. After earning just eight points in the first 13 matches of the second half of the season, Schaefer and former Köln player Dirk Lottner replaced Solbakken. The club, however, was relegated at the end of the season, finishing in 17th place, having accumulated €33m debt, and €11m negative equity. In April 2012 the club members elected a new board of directors, Werner Spinner as president, Markus Ritterbach for marketing, and Toni Schumacher for sport. In the 2012–13 season, under new trainer Holger Stanislawski, Köln finished in fifth place in the 2. Bundesliga, missing out on promotion back to the top division. In 2012 the board hired Jörg Jakobs as director of football who then got promoted in 2014 to sporting director, chief scout and director of the academy. In January 2013 Alexander Wehrle joined as managing director of FC Köln ltd. Wehrle was working as assistant for VfB Stuttgart president Erwin Staudt, especially for rebuilding the stadium. In summer 2013 Peter Stöger and Manfred Schmid were hired as coaching team, and Jörg Schmadtke as general manager. 2013–14 Köln finished first in the 2. Bundesliga and earned promotion to the top division. It was followed by a 12th place 2014–15, ninth in 2015–16, and fifth place in 2016–17. 25 years after the club's last appearance in international football to date they qualified for the Europa League. After restructuring and repaying debt, equity turned from €11m negative to €20m positive. The turnover increased from €56m in 2012/13 to more than €120m in 2016/17. The team plays its home matches in the Müngersdorfer Stadion, also known as the RheinEnergie Stadion for sponsorship purposes. It has a seating capacity of 45,965 and the average attendance in the 2015–16 season was 48,676. The stadium sponsorship comes from a contract with the local power supplier RheinEnergie AG. However, most fans still call the stadium "Müngersdorfer Stadion", named after the suburb of Müngersdorf, where it is located. The club owns the Geißbockheim training centre currently known as RheinEnergieSportpark for sponsorship, located in Sülz which is a municipal part of Köln in the southwest of the city. The centre is home to the Franz-Kremer-Stadion being home to 1. FC Köln II. Köln's kits are currently made by Uhlsport, who will pay €3.5m a year instead of €2.5m. The women's team was promoted to the Bundesliga in 2015. They were directly relegated back to the 2. Frauen-Bundesliga after the 2016–17 season ended, but managed to regain promotion in May 2017 to the Bundesliga. ^ "Mitglieder-Boom dank Europa FC knackt bald die 100.000!" [Member's boom thanks to Europa League FC will soon break the 100,000!] (in German). express.de. 16 June 2017. Retrieved 12 August 2017. ^ "Record-Setting Members' Meeting". fc.de. 26 September 2017. Retrieved 27 September 2017. ^ Schnee-Allergie beim Samba-Kicker (in German) Weltfussball.de, published: 27 March 2015, accessed: 28 March 2015. ^ "Das ersehnte Tor war zuwenig" (in German). fussballdaten.de. 2 March 2002. Retrieved 10 December 2014. ^ "Köln confirm Stale Solbakken as new coach for next season". goal.com. 14 May 2011. Retrieved 15 May 2011. ^ Der Leiter Lizenzfußball bleibt und rückt auf: Zukünftig ist Jakobs als Sportdirektor mit mehr Kompetenzen ausgestattet, 23 June 2014. ^ Horstmann-Nachfolger Schwabe soll FC das Sparen lehren, 11 October 2012. ^ Mer stonn zo Dir, FC Kölle!, Stern, 19 November 2016. ^ "Germany » Bundesliga 2015/2016 » Attendance » Home matches". worldfootball.net. Retrieved 14 May 2016. ^ Kölns Ausrüster-Deal Warum Uhlsport – und nicht Nike oder Adidas? – Quelle: http://www.express.de/28101678 ©2017, express, 2017-08-02. ^ "1. FC Köln – Mannschaft" [1. FC Köln – Squad] (in German). 1. FC Köln. Retrieved 26 May 2016. ^ Ralf Bueno. "UEFA Team Ranking 2017". Retrieved 20 May 2017. ^ a b c d "1. FC Köln". kicker.de (in German). kicker. Retrieved 18 November 2014. ^ "Funkel Nachfolger: 1.FC Köln verpflichtet Marcel Koller". Der Spiegel. 2 November 2003. Retrieved 18 November 2014. ^ a b "Stevens beerbt Koller". kicker (in German). 14 June 2004. Retrieved 18 November 2014. ^ "Stevens trainiert Kerkrade". kicker (in German). 27 May 2005. Retrieved 18 November 2014. ^ "Daum zu Fenerbahce – der FC ist auf Trainersuche!" [Daum to Fenerbahce – the FC is looking for a new coach!] (in German). kicker.de. 2 June 2009. Retrieved 18 November 2014. ^ "FC entlässt Soldo – Schaefer auf der Bank gegen Löwen". Kicker. 24 October 2010. Retrieved 18 November 2014. ^ "Schaefer tritt zurück, Finke übernimmt". Kicker (in German). 27 April 2011. Retrieved 18 November 2014. ^ a b "Köln entlässt Solbakken – Schaefer hilft aus" (in German). kicker. 12 April 2012. Retrieved 18 November 2014. ^ "Köln bestätigt: Stanislawski wirft das Handtuch". kicker (in German). 18 May 2013. Retrieved 18 November 2014. ^ "Neuer FC-Trainer: Stöger ist raus aus der Warteschleife". kicker (in German). 12 June 2013. Retrieved 18 November 2014. ^ "AUFSTIEG IN DIE BUNDESLIGA" (in German). Retrieved 16 November 2015. ^ "EIN NIE GEFÄHRDETER ABSTIEG: FC-FRAUEN MÜSSEN RUNTER". geissblog.koeln (in German). Retrieved 17 September 2017. ^ "1. FC Köln zurück in der Frauen-Bundesliga". zeit.de (in German). Archived from the original on 11 October 2017. Retrieved 17 September 2017.